What better way to celebrate this time of year than by watching a holiday themed horror movie? Obviously there's no shortage to choose from with new one's being introduced each year. From Black Christmas, the classic that started it all; to the most recent holiday/horror offering, Anna and the Apocolypse, there's something out there to satisfy everyone. This year I settled on the 2016 release, Better Watch Out. This evening I decided to pair my movie with some Humboldt Kush. For those unfamiliar, this particular indica-dominant hybrid is relatively rare and pretty difficult to find in my experience. And while the genetics are a mystery, it's believed to be a cross between OG Kush and one of the pure Afghani landrace strains. Right away, the smell of the buds hit you with intense earthy notes like pine and soil with subtle citrus aromas as well. The flavor matches with zesty lemon and strong diesel on the exhale. The budtender described that this strain is "extremely sedative" so after polishing off my bowl, I wasted no time getting ready to start the flick. During the opening credits I could already feel the cerebral effects kicking in as the body high began quick work at completely relieving all my muscle and joint pain. I was high, I was comfortable, and most importantly, I was ready for some horror. The light-hearted first act coupled with the movie's punny title made it all the more shocking when things take a hard left-turn into WTFville during the second act. Better Watch Out is actually a bit difficult to pin down. Things begin comedic and self-aware in the same vein as The Babysitter or even The Final Girls. But whereas those two movies were TV-MA and PG-13 respectively, this movie is R-rated - and a pretty solid R at that. Even still, the light-hearted first act coupled with the movie's punny title made it all the more shocking when things take a hard left-turn into WTFville during the second act. But I'm getting ahead of myself. In fact, I don't even want to hint about the bloodsoaked mayhem that hits the fan during the second and third acts for fear of ruining the beauty of this movie. Let's just say it starts off as a pretty cookie-cutter teen horror comedy but doesn't end that way. Not even a little bit. The evening begins innocently enough. And once Ashley arrives and the parents leave, things slowly begin to take shape. Side note, Luke's parents are played by horror alum Virginia Madsen (Candyman, The Number 23) and Patrick Warburton, Puddy from Seinfeld. Okay, back to the kids... Once alone with the appropriate inappropriate object of his desire, Luke turns up the charm and immediately goes into full on "woo" mode. But Ashley passes on his invitation to watch a horror movie and calls her boyfriend instead. Later, Luke makes another pass by opening a bottle of champagne in a sad attempt to get her to drink with him. Again, the mood is pretty light and innocent... until it isn't. Things only become more sinister as the evening progresses. From unidentified phone calls, to once closed doors now open, Luke and Ashley become increasingly worried that there may be an intruder plotting a home invasion. Things get real when a brick is hurled through a window inscribed with the warning "U LEAVE. U DIE". Being the horny 12-year-old boy he is, Luke uses this as an opportunity to demonstrate his bravery and prove to Ashley that he's better than any of her boyfriends and worthy of her love. What comes next is a well-constructed evergrowing series of twisted, psychologically and brutally disturbing events. Things get messy, y'all. Unfortunately, it was at this point during Better Watch Out that the Humboldt Kush high began transitioning into its second stage. Although my body was still relaxed and pain free, the cerebral head high was all but gone. And I'll be honest, it's the head high that makes movies most enjoyable. But I digress. In fact, this is probably a good spot to wrap things up. 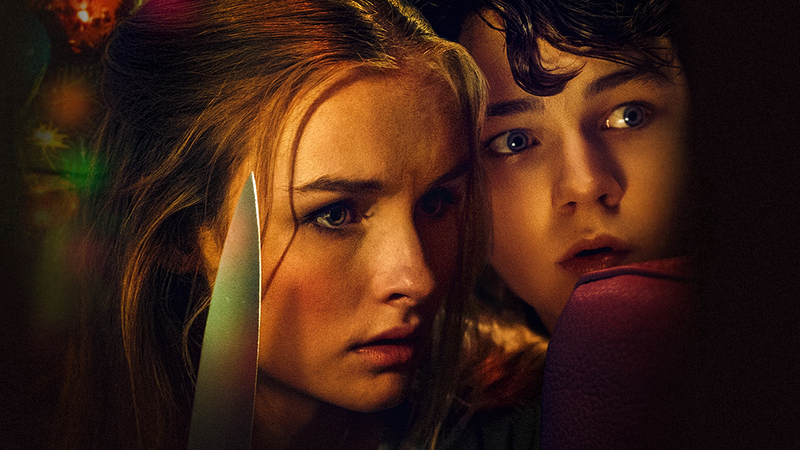 Overall, Better Watch Out is a better-than-it-has-to-be gem within the holiday/horror sub-genre with strong performances by the two lead characters Olivia DeJonge and Levi Miller topped off with a twisted tale that'll drop your jaw. I could go on but any more details may ruin what could be a great experience for first time viewers. Trust me, you'll be happy I didn't reveal too much. But enough about me, how about you? Have you watched Better Watch Out or tried Humboldt Kush? What are your thoughts? Did you have a similar experience? Please leave a comment and let me know. And of course, don't forget to follow Bloody High on Instagram, Twitter and Facebook.